There’s a fleeting strategic opportunity for the U.S. to influence Beijing’s looming and evolving maritime strategy. Last July, I authored an article titled “America Has a Chance to Beat Back China’s South China Sea (SCS) Strategy,” highlighting an aggressive Chinese public relations (PR) campaign throughout the region and across the globe to influence world opinions and present Beijing’s legal and political positions in the SCS. I suggested that the PR shift may be part of larger Chinese recalibration of its assertive (and oftentimes unilateral) actions in the SCS to meet the mounting unfavorable geopolitical conditions and regional trends (at that time). I then asked what the PR shift reveals about Beijing’s developing maritime strategy, and, more importantly, what could Washington do to shape and influence that strategy? In this follow-on article, I further assess the evolving strategy and outline how Washington could respond. Beijing’s forthcoming maritime strategy will shape its comportment and actions in the maritime domain in the near- and far-term, and possibly in the other contested domains of space and cyberspace as well. Chinese maritime strategists have long called for a maritime strategy – top-level guidance and direction to better integrate and synchronize the multiple maritime lines of effort in furtherance of national goals. For Beijing, the ruling by the International Tribunal of the Permanent Court of Arbitration (PCA) at The Hague makes this imperative even more pressing. China’s Communist Party’s Central Committee, State Council, and Central Military Commission in July signaled their intent to draft such a document as part of Beijing’s grand strategy for regional preeminence (and possibly global preeminence). The document proposes coordinating Beijing’s maritime development with efforts to safeguard its maritime rights and interests. The calculus is simple for Beijing. Why would China opt to directly compete now with the stronger U.S. military when it can subtly and quietly undermine American regional preeminence through lasting economic partnerships and enduring political agreements that underscore and reinforce its strategic narratives – the uncertainty of U.S. commitment and policy constancy, the geographic reality of China’s presence, and the economic benefits derived from good ties with Beijing (an economic juggernaut and rising global power). China can always recalibrate later based on the fluid strategic conditions and confront the United States when opportunities arise, or if and when the military balance of power shifts more in its favor. In creating a formal maritime strategy, Beijing may be trying to fill domestic legal gaps that it sees as hindering its ability to defend territorial claims in the East China Sea (ECS) and SCS, and justify its activities in international waters. Last March, China announced its intent to create new domestic maritime laws in support of its evolving maritime strategy, part of a continuing effort to set the terms for international legal disputes it expects will grow as its maritime reach expands. These developing domestic maritime laws bear watching as a public expression of Beijing’s strategic intent in the maritime domain, a possible harbinger for the other contested domains, and an attempt to right a perceived historical wrong. China feels disadvantaged (and taken advantage of) by a Western-dominated system of international maritime laws established when it was weak as a nation and had little say in its formulation. A prominent example of shaping maritime law to support maritime strategy is China’s expansive and fluid legal position on the permissibility of military activities in the exclusive economic zone (EEZ). Beijing contends that military activities on the high seas and in the EEZ are unlawful based on the legislative spirit of United Nations Convention on the Law of the Sea (UNCLOS) and a requirement from that treaty that the high seas be used only for peaceful purposes. Though the language in UNCLOS mentions only the high seas, Chinese legal scholars further assert that military activities are unlawful in the EEZ as well. The logic is that if UNCLOS requires states to use the high seas only for peaceful purposes, then foreign activities in the EEZ (a special area governed by the coastal state) must also be peaceful and so military activities, which are inherently not peaceful, are not permitted. 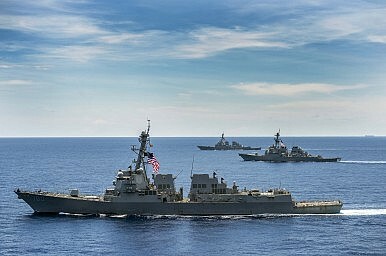 American legal scholars counter that military activities have been a recognized lawful activity on the high seas and in the EEZ under customary international law, and conducted in the exercise of freedom of navigation preserved within UNCLOS. In context of its unfolding maritime strategy, the aforesaid broad legal stance makes a lot of legal, political, and military sense from Beijing’s perspective. China wants to set the enabling conditions for its future maritime strategy in terms of implementation and sustainment. Beijing seeks to expand its maritime borders through claimed EEZs, buttress and justify its growing maritime presence and operations, and exert greater control within those maritime zones with legal underpinnings, and eventually shape international maritime law to be more equitable and complementary to its national interests. Do Exercise Strategic Patience. Despite the apparent warming of China’s ties with regional neighbors (the Philippines, Malaysia, Myanmar, and Thailand), it may be premature to conclude that the recent changes in geopolitical conditions and regional trends have markedly and permanently shifted in Beijing’s favor. The Indo-Asia-Pacific remains a very fluid environment, which makes any recalibrations transitory. Hence, Washington should exercise strategic patience and allow regional dynamics to settle before setting a new policy course. If the regional trajectory does indeed turn unfavorable to long-term U.S. national interests, then it becomes even more an imperative to do the following to reverse the tide. Do Not Cede the Strategic Narrative. To compete with Beijing, Washington needs to reframe the narrative that China dominates with accusations of containment. Washington’s strategic message seems largely reactive and defensive, simply seeking to counter Beijing’s message. Consequently, the United States could be more proactive and seize the messaging initiative like it did during the Shangri-La Dialogue in June and in the November/December 2016 edition of Foreign Affairs. Secretary of Defense Ashton Carter hit the right resonance notes in both forums with his gentle reminder to the region of the United States’ traditional role as the “principal underwriter” of maritime security, political stability, and economic prosperity in the Indo-Asia-Pacific; his warning for China not to build a “Great Wall of self-isolation”; and his use of the catchall concept of “principled security network of alliances and partnerships” to outline a vision that the United States has long sought to describe. The message needs to be reiterated at every opportunity and at the highest level, and synchronized throughout the whole-of-government and with allies and partners. There can be no U.S. policy seams or diplomatic space for Beijing to exploit. In short, acknowledge that both countries have competing visions; highlight the flawed thinking of Beijing’s approach; champion Washington’s approach as the better choice; and encourage China to act as (or become) a more responsible global stakeholder and net provider of maritime security that contributes positively to the international system. Do Not Cede the Strategic Initiative. The maritime strategy and accompanying domestic maritime laws are coming, but China has not said when. Ask Beijing for discussions and briefings on its developing strategy and laws now, and actively engage in the private and public domains. Challenge vague or problematic content, such as how the security and economic pieces fit together. Inquire how they comport with extant international maritime law (UNCLOS) and contribute to the regional security network, and if they do not, why not. Otherwise, silence concedes the strategic initiative to Beijing and allow it to control the strategic narrative. Do Maintain the Rebalance. To date, the most effective counterbalance or check to China’s campaign of tailored coercion in the ECS and SCS is the U.S. rebalance – an amalgamation of integrated soft and hard deterrent powers (multilateral diplomacy, economic integration, and military presence) to reassure allies and partners by strengthening defense (security) relations and demonstrating resolve and commitment; enhance force posture, capabilities, and readiness through geographical distribution, operational resilience, and political sustainment; and bolster economic ties with a multinational trade agreement (Trans-Pacific Partnership or TPP). All in all, the rebalance imposes the largest strategic cost to Beijing while providing the greatest reassurance to allies and partners. Do Involve the Interagency (Whole-of-Government). China studies other nations’ current and historical approaches – particularly the 17th to 19th century British Empire and 20th century America – as it develops its own maritime strategy, providing an opening for engagement and a degree of shaping. Given the exceedingly broad nature of Beijing’s approach to maritime issues (an amalgamation of Corbettian/Mahanian principles, Chinese nationalism, and Chinese characteristics), an appropriate forum could be the U.S.-China Strategic and Economic Dialogue reinforced by other forums like the Shangri-La Dialogue and Association of Southeast Asian Nations Defense Ministers’ Meeting Plus. Do Ratify UNCLOS. The ratification of UNCLOS will undercut Beijing’s calling into question Washington’s sincerity to international norms. China is a member of UNCLOS but often violates its provisions, whereas the United States has not ratified UNCLOS but has been its foremost champion on behalf of freedom of navigation, global commerce, and international rule of law. Do Mitigate Plans for TPP Withdrawal. President-elect Trump reaffirmed his intent to withdraw from the TPP deal. The ramifications of such a move will have far-reaching and lasting foreign policy consequences that cannot be understated or underappreciated. The TPP is by far the most “promising and enduring” counter to China’s developing maritime strategy. The powerful economic integration tool would have bound the United States to 11 other regional economies, guaranteed a trading system with higher standards, and complemented the other rebalancing instruments of multilateral diplomacy and military presence. That being said, the heart of the matter now is how best to deal with a future outcome with no TPP. Regional countries view the TPP as a litmus test for U.S. credibility in Indo-Asia-Pacific. The demise of TPP will not only reinforce the Chinese internal belief and external narrative of a declining United States and a rising China; it will also impel many regional countries, to include possibly some allies and partners, to increasingly consider other economic alternatives like the China-led RCEP. If so, Beijing will gladly take on the burdens and benefits of regional economic leadership, a step closer to a possible Chinese sphere of influence in the Western Pacific. At the end of the day, the strategic window of opportunity to shape and influence Beijing’s developing maritime strategy may be closing soon for Washington. To China, U.S. inaction implies tacit acknowledgement and consent to execute its maritime strategy and strategic ambitions unhindered and unchallenged. At stake is nothing less than U.S. preeminence in the Indo-Asia-Pacific and ultimately as a global power. For decline is a deliberate choice, not an imposed reality. Tuan N. Pham has extensive experience in the Indo-Asia-Pacific. The views expressed are his own and do not reflect the official policy or position of the U.S. Government. Neither China nor the U.S. can back down now without losing credibility and face.